As an added bonus during the Spring 2015 Friends and Family Night, an appreciative audience was entertained by one of CWSC well known quartets, Harmonycatz. CWSC presented a donation to the Calgary Girls Choir and took the opportunity to both entertain and be entertained by the Calgary Girls Choir. What an amazing group! The funds donated to the Calgary Girls Choir were raised from the CWSC's Bowling for Barbershop 2014 event. Members of the CWSC joined other singers from Calgary and Lethbridge choruses in a Region 26 sponsored workshop to learn two new regional songs. Many thanks to the Region for their support! Congratulations to Jean Smith on receiving her 50 year membership pin from Sweet Adelines International President, Marcia Pinvidic during the Baltimore 2014 International Convention. Jean is a baritone who has been singing with the Chinook Winds Show Chorus for all of those 50 years. Performing on stage during the Spruce Meadows Christmas Market on Sunday, November 16, 2014 was a great experience and the perfect start to the Christmas season. 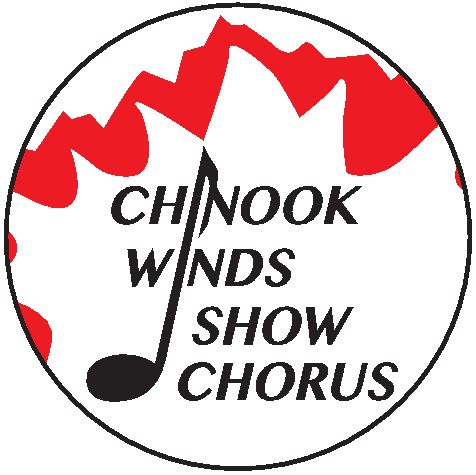 The Chinook Winds Show Chorus was directed by Maja Weibe. The Harmonycatz were also featured during the 45 minute spot.